Item # 305796 Stash Points: 1,799 (?) This is the number of points you get in The Zumiez Stash for purchasing this item. Stash points are redeemable for exclusive rewards only available to Zumiez Stash members. To redeem your points check out the rewards catalog on thestash.zumiez.com. 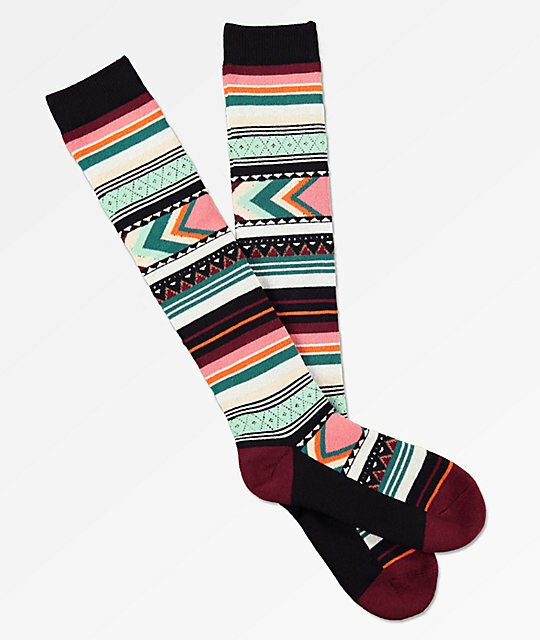 Don't struggle with cold toes this snow season thanks to the Aperture Ione Snowboard Socks. These brightly striped socks are mostly cotton while featuring a plush cushioned construction for maximum comfort. Ione Snowboard Socks from Aperture. Plush cushioned construction for a cozy feel. 87% cotton, 12% polyester, 1% spandex.